[Jesus said,] "Your father Abraham rejoiced as he looked forward to my coming. He saw it and was glad." The people said, "You aren't even fifty years old. How can you say you have seen Abraham?" 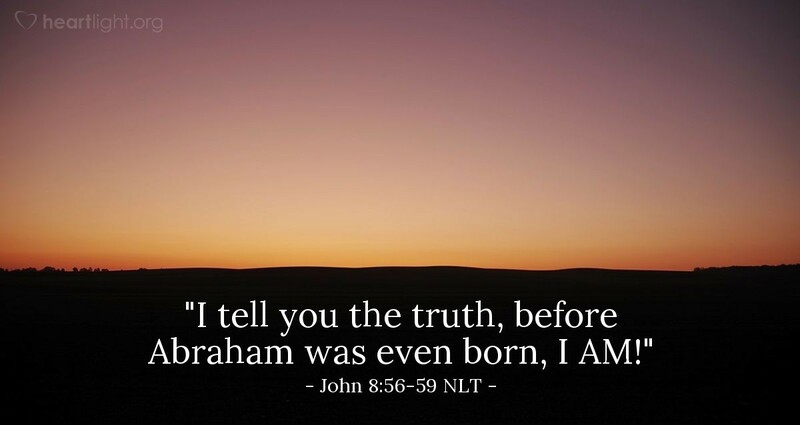 Jesus answered, "I tell you the truth, before Abraham was even born, I AM!" At that point they picked up stones to throw at him. But Jesus was hidden from them and left the Temple. Like so many other things Jesus says in this chapter, this claim is audacious and bold. It is also true. Jesus didn't just happen on the scene when he came to earth; he existed before any created thing. That's why it is so important that we pay attention to him. He not only sacrificed himself for us, but he left heaven's glory to come and live with us and show us God's love. Father, open my heart to the teaching and truth of Jesus and give me a greater sense of his authority, his majesty, and his lordship in my life. In Jesus' name, I pray. Amen.